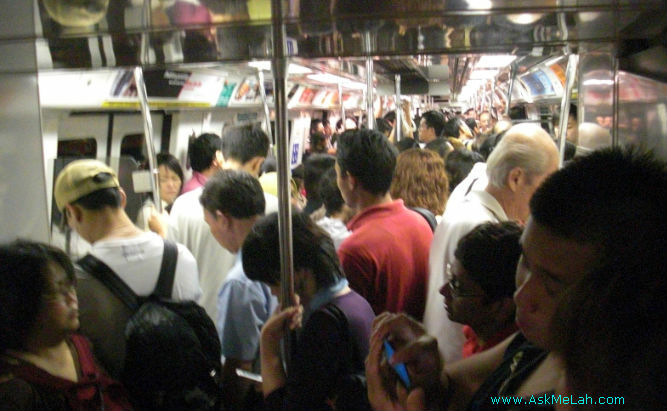 Home › Social Ills in Singapore › Dismal State of Singapore Traffic Police and LTA › National Shame: You call this world class transport system? National Shame: You call this world class transport system? This may be an isolate incident but it left me wondering what’s wrong with our transport system. I was at a local University yesterday and arrived at the bus stop for Bus Service 179, I waited at 5:25pm and finally got on the bus at around 6.25pm — Almost one hour and 15 consecutive jam packed buses later which were packed to the brim. During the one hour, I saw some students gave up after waiting for a long while but many have chosen to talk to friends or listen to their iphone – but majority just chose to do nothing! imagine the precious time wasted for the estimated 120-180 student crowding in that small little bus stops in that one hour. I also noticed amongst them many blonde hair students which I assumed were overseas exchange students. I wonder how will they think, some third world countries can do better than our pathetic bus system which can not cope with the sudden influx of immigrants and foreign workers? Granted, it may be the rush hour effect and I hope the incident is an isolated one, more importantly, I hope SBS is not treating these poor students as cheap paying clients which will endure their third rate customer service without complaints. Don’t forget that amongst the waiting crowd are some of the University’s very owned executives and workers as well! Been to Disney USA? They can fetch hundreds of thousands of paying customers who flock to Disneyland daily at the opening hours and the closing hours, surely technology is not an issue. NTU can also start some green projects such as renting of electric bicycles (hilly terrain within NTU) for example. Don’t even get me started on Taxi system in Singapore. It is certainly “unique” system in Singapore. You have all kinds of surcharges from midnight, peak hour, booking, airport, ERP which makes Singapore taxi fares one of the most complicated in the world, even the locals are confused let alone the foreign visitors who often accused our poor taxi drivers for overcharging them. I have been travelling to many parts of the world, most places just give me a flat rate, places like Hong Kong and some European cities don’t even charge booking fees. In order to maximise their earnings, the taxi drivers often timed to get the maximum charges they can get thus adding woe to the passengers who just keep watching empty cabs zooming pass them. 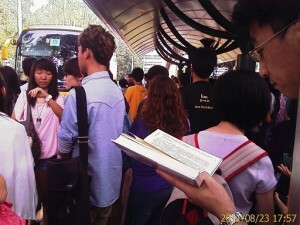 Somehow there is simply no political will esp on the part of MOT and LTA to do something for simple thing like this. I am sure they must have conducted numerous overseas study trips to learn how other countries can do what we have failed. Sad to say even the Bangkok and Guangzhou taxi systems beat us hands down. As for MRTs (subways or Metros as are called in other countries), it is near impossible to get on during peak hours. It is mostly crowded even outside peak hours and the waiting time could be as long as 20-30 min long if you just miss the train. I can easily name Taipei, Hong Kong, London, New York, Guangzhou, Tokyo which I have better experiences. Even the Bangkok’s BTS does better than our MRT system in terms of waiting time and comfort though it looks cheaply built. We have changed a new minister, let’s see if the new minister Liew Tuck Yew is able to do magic though I am not too optimistic. Short of an overhaul of transport system is required to change this profit-driven inefficient system of ours. [Updated 23 Sep 2011] Ironically in today’s newspaper titled “600 motorists go car-free for a day” where some Singapore residents left their cars at home on World Car-Free Day yesterday, an engineer Chew Mei Ling took the public transport for one day, her first in four years, this was her experience: she had to let a couple of trains pass before getting on, stand the entire journey from her home in Toa Payoh to Jurong East, and then take a company bus from there to her International Business Park workplace. The trip took more than an hour instead of 30min by car. Her conclusion? “I’d probably not do it again.” That is the self serving first world public transport system!!!! World-Class Public Transport System? RUBBISH! ‹ How much reserve do Singapore really have?